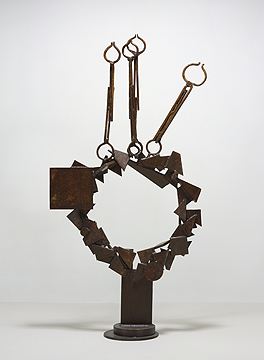 ABOVE: David Smith, Voltri-Bolton X, 1962. Steel, 81 1/4 x 42 x 11 1/4 inches. Collection of Jerome and Ellen Stern. Photo by David Heald, © 2006 The Estate of David Smith/Licensed by VAGA, New York. Every Friday evening from 5:45-7:45 PM, the Museum offers Pay What You Wish night. Enjoy refreshments from the Guggenheim Café in the Frank Lloyd Wright-designed rotunda. Become a member by February 2 to attend the Members' Private Viewing on February 3. Wind down for the weekend with cocktails and music while exploring David Smith's boldly original sculptures with a free guided tour. Join now and receive FREE admission to First Fridays. Listen to the world's hottest DJs and sip a cocktail while viewing works by America's preeminent 20th century sculptor. Members can also enjoy complimentary refreshments at the exclusive Members VIP Lounge.